October 31, 1979 was a particularly productive day for Buddy Guy and Junior Wells. While overseas on a tour, the pair spent a day in the studio in France recording a pair of discs…..one you’re probably aware of (Guy’s Stone Crazy!) and one you should know about (Well’s Pleading The Blues, featuring Guy). Both used Guy’s brother Phil on rhythm guitar and his band, which included J. W. Williams on bass and Ray “Killer” Allison on drums. While touring in France, promoter Didier Tricard asked Guy if he was interested in making an album. Guy agreed, on the condition (half-jokingly) that Tricard name the record label after Guy’s mother, Isabell. In the middle of the tour, Guy stepped into the studio with his brother and band in tow. It had been seven years since Guy’s previous release, the album for Atco with Junior Wells, Eric Clapton, Dr. John, and others. Unlike that effort, Guy had total artistic control and freedom for this album, which was originally released on the Isabel label as Blues Giant. Recorded in a single day, this was probably Guy’s rawest, most honest recording to date….some say ever. From the opening notes of “I Smell A Rat,” the words that spring to mind are “organized chaos.” It’s about as close as anyone has come to capturing his appeal on record. The second cut is a modernization of Guy’s Chess side, “Stone Crazy,” retitled “Are You Losing Your Mind?” The balance is just right here, with his razor sharp leads and his vocals on the edge of over-the-top. “You’ve Been Gone Too Long” is a straight-ahead rocker and probably the least interesting track here. Much better is “She’s Out There Somewhere,” which settles into a nice groove. “Outskirts of Town” is another standout, a slow burner with another long guitar intro and barely-in-control vocal, as is the fiery “When I Left Town,” which threatens to blow the door off the hinges. 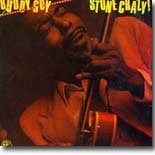 Alligator Records picked up the disc for American release in 1981, and changed the title to Stone Crazy! It has been one of the label’s best-selling discs since that time and remains one of Buddy Guy’s finest hours in the studio. 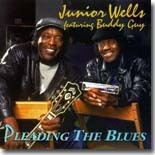 Wells’ Pleading The Blues was recorded on the same day with the same band. As unrestrained and manic as Buddy Guy was on his own session, he was incredibly understated and controlled while providing sympathetic backing to Wells, who was at or near his peak on this session. The nearly eight-minute title track opens the disc and it sets the tone perfectly, a smoldering cut blending Wells’ reserved pleading, Phil Guy’s crystal clear rhythm guitar, and Guy’s scurrying fills. You almost hate to hear it come to a close. Next up is a tight reworking of Tampa Red’s “It Hurts Me Too.” Wells shows he’s adept at soul/blues as well with a sparkling cover of Brook Benton’s “I’ll Take Care of You.” On these two tracks, you really experience the wordless interplay between Guy and Wells. These two had been together over a decade at the time of this recording and had it down to a science. “Quit Teasing My Baby” is another standout, a swinging track with Wells almost scats the verses and Guy laying down the jazziest guitar this side of Wes Montgomery. There are also a couple of tracks, “Cut Out The Lights,” and “I Smell Something,” where Wells does his James Brown routine. These tracks aren’t as compelling as the straight blues, but Wells does a good job on them (many older fans say Wells was doing James Brown long before James Brown was). Not enough can be said about the rhythm section of Phil Guy, J. W. Williams, and Ray Allison. These had to have been two totally different sessions mood-wise, but they adroitly handle both, seemingly without breaking a sweat. Tricard appears to have been the perfect producer, wisely turning everything on and getting out of the way. Pleading The Blues is an underrated classic that deserves more attention than it’s received. Oddly enough, Pleading The Blues didn’t see a release in the United States until 1993, when Evidence Records reissued it. Evidence did blues fans a great service throughout the ’90s by reissuing dozens of recordings that had either never been released domestically or suffered from poor distribution upon initial release. Neither of these blues icons made another recording for over a decade. After years of toiling in the shadows of many of his protégés, Guy finally saw some mainstream success in the early ’90s when he signed with Silvertone Records. Wells recorded several discs with Telarc, finally hitting his stride with them a couple of years before his death in 1998. However, these two releases offer a great opportunity to hear both of these artists at their creative peaks.